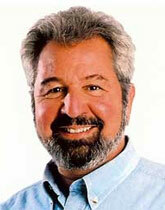 Bob Vila has spent his career helping people upgrade their homes and improve their lives. Before Bob’s life in broadcasting, he launched his own residential remodeling and design business. Earlier still, he served as a Peace Corps volunteer, building houses and communities in Panama. Bob learned first-hand about home building from his father, who hand built their family home. Bob has written 12 books about remodeling your home, buying your dream home, and visiting historic homes across America. It’s fair to say that buildings, especially homes, are his life’s work. In his pilot series “Building Green,” he introduces the audience to the newest green building technologies and products. He gives you all the information needed to make the best choices — both for you and for the planet. Bob has always been focused on how to take advantage of innovation without sacrificing the legacy and traditions of the past. He shows you how to combine the best of the old with the new. Bob is often on the move, but mostly he can be found at home in his native Florida or in Massachusetts in the summer months and often in New York. At the University of Florida back in the ’60s he studied journalism, and later in Boston for architecture. Over the years he’s supported many causes dealing with housing and architectural preservation. Bob has been actively involved with Habitat for Humanity and helped them blitz build a house in Yonkers, NY. He’s worked for years with the National Alliance to End Homelessness, supporting the work of many organizations throughout the country. In the last five years Bob has been helping out with the restoration of Ernest Hemingway’s home and collections at Finca Vigia near Havana, Cuba. This place was his home from 1939 until his death, and he left it to the Cuban people to be run as a museum. This project has allowed him to visit his parents’ homeland several times. Bob Vila, host of the television show "This Old House" and expert at home improvements, details the ins and outs of restoring, rehabilitating and renovating an older house. Bob Vila, host of the PBS series This Old House, which features home improvement and repair projects, here makes recommendations for assembling a properly equipped workshop that includes a range of common and special-purpose tools. 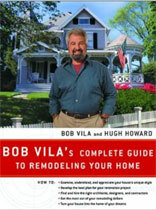 Bob Vila, recognized as America's foremost authority on renovation and of the popular TV series This Old House and Bob Vila's Home Again, now presents the quintessential book on remodeling your home. Millions count on Bob Vila for reliable, understandable advice and now the wealth of knowledge is at your fingertips to help you increase both the value of your home and your living enjoyment.